Features : 1. Type: conical, round or polygonal; 2. Material: Q235 or Q345; 3. Out coating:Hot dip galvanized and powder coating. Uses : For Traffic signal system. Quality: 1. Octogonal and conical Street Light Pole is duly tested so as to assure their impeccable quality; 2. Are available in various sizes; 3.Can be satisfied as per the clients' requirement. Looking for ideal Traffic Signal Galvanized Steel Poles Manufacturer & supplier ? We have a wide selection at great prices to help you get creative. All the Traffic Signal Pole Manufacturers are quality guaranteed. 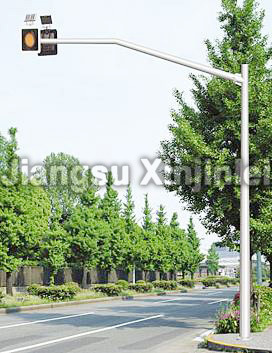 We are China Origin Factory of Steel Traffic Signal Pole. If you have any question, please feel free to contact us.